Great Music venue in Lower East Side with no cover – Rockwood Music Hall. Seems like they have 9-11 1-hour shows per night. The reason I got there was Mark Guiliana’s Thing (the best thing I know about New Jersey 😀 :D). It was Jason Fratticelli on bass – electric bass this time, he was just as killin’ on it as on Wednesday @ Rose, where he played acoustic bass. And Aaron Dugan on guitar. Lots of experimenting, delay, flanger, nice work with looper. 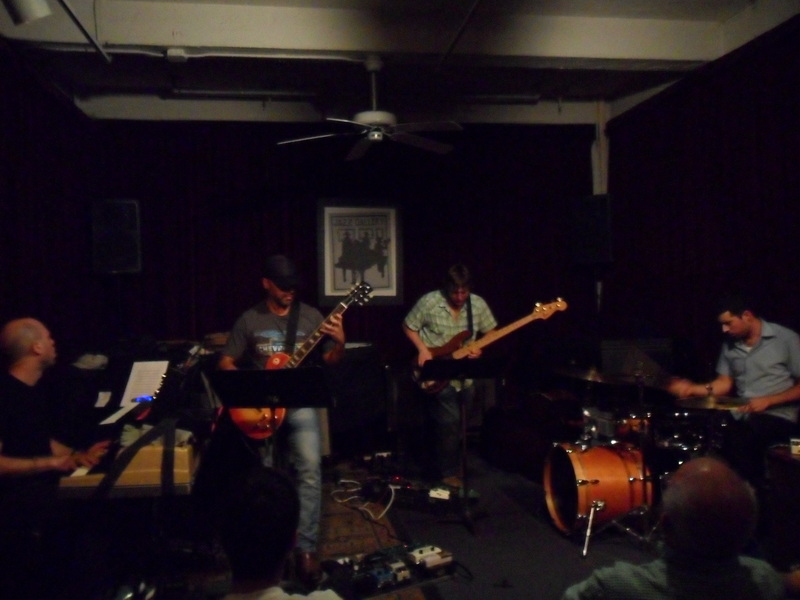 The live vibe reminded me of Led Zeppelin – incredible grooves and playing together. I got there a little late but just in time to see Matisyahu sitting in for a tune. That was unbelievable. This really random-looking guy strolls on the stage and gives a killin’ performance playing some rap/reggae music with the band and taking a great beatboxing solo. Does that kind of thing happen anywhere else besides New York? I missed hearing Mark Guiliana – he has been out of town for a while, touring in Europe. But there it was again, his Thing @ Rose. Mark Guiliana is really so much more than a drummer, he is one of the most fascinating jazz musicians on the planet I would say :D. This time he had Jason Fratticelli on double bass and Mike Severson on guitar. It was great to discover Jason Fratticelli – amazing genius riffs and groove power, really great straightforward time and tone. I hope I’ll get to hear him play with Mark Guiliana some more, it seemed to be a great match. But interestingly, maybe I’m totally wrong about this, but I felt the music got a lot more obscure when the keyboard player joined in for a while. But yeah, it must be the greatest challenge to keep up with such perfect musicianship, for that’s what the case was there. Well, it was 4th time hearing Mark Guiliana’s Thing, I’m totally a fan of the project – live improvised experimental music as good as it gets. With the right band, it can be life-changing.